12 Baniyas Chemical Genocide Planned? 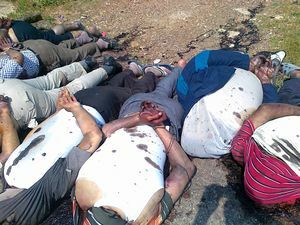 May 6 Banias, 13 victims in "Banias." 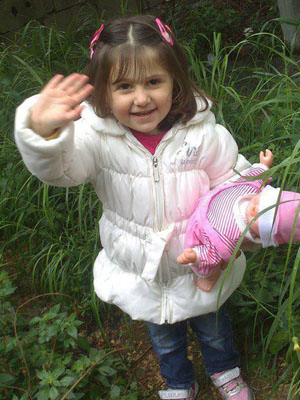 Only one, Sidra Tahhouf, cute little three-year-old girl with a photo, given as specifically Banias: Ras al-Nabea. Ras al-Nabi' May 4: Noor Sohayb Khaddam adult female - Noor Sohayb Khaddam's daughter, child. 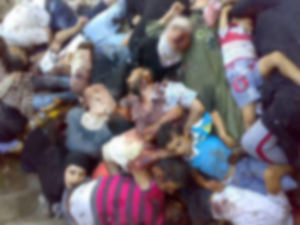 See here for some interesting visuals and thoughts on the Othmans killed in al-Bayda. Is Dahbash the same as Debesh? Ras al-Nabi' May 3: MOhammad Jalloul al-Dahbash (married and has children) - Moustafa Mohammad Jalloul al-Dahbash, age 14, "Martyred with his father by regime forces"
I scanned Wikimapia for possibly useful labels around Baniyas. There were a few, including (translated) "The land of the sons of Abdul Kafi Sabagh ( الصباغ ) (map link). 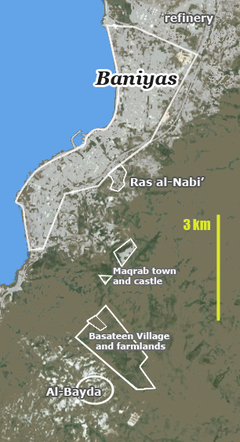 Right by Maqrab, north of al-Bayda but a ways from Ras al-Nabi'. Fully vulnerable to roaming "Shabiha" attacks. If Abdul came through as a middle name, it would be a better match. In fact by the first name passed down as middle name pattern suggest Mostafa is the father of Ahmed Mustafa, with the wife and son Ammar Ahmed, for three generations in one house. Nabil and Walid might be sons of an Ali Sabagh. Adult male. Killed May 4 in Ras al-Nabea. Shown dead. 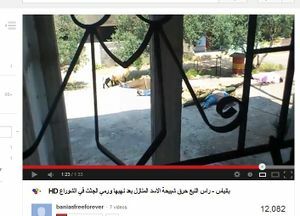 Adult male, Killed May 5 in Banias, unspecified. Shown dead. Adult male. Killed May 4 in Ras al-Nabea. Shown alive. Child, female, age 16. Killed May 4 in Ras al-Nabea. Shown alive. Adult, male, Killed May 4 in Ras al-Nabea. Shown alive. Child, male, age 16. Killed May 4 in Ras al-Nabea. Shown alive. 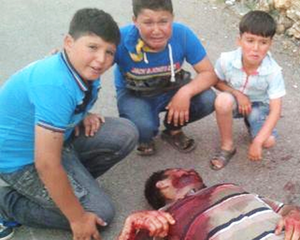 Child, male, age 9, killed May 6 in Banias, unspecified. Shown alive. 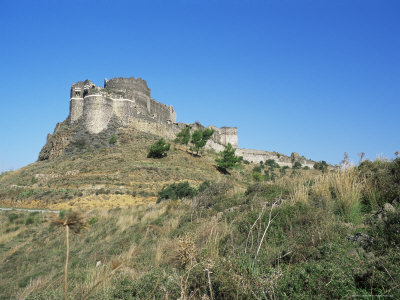 Otherwise, he said, "the situation in Baniyas, Tartus, Latakia and the surrounding areas is peaceful and calm." In contrast, we have images of horrific violence against women and children. Perhaps these happened elsewhere? Actually, it could be. The "thousands" fleeing were, according to Dr. Haydar, "The departure of two or three households." We also have to consider the wall's not totally vertical, or the rugs wouldn't hang out a distance like that. We have two different days of pictures here? I'm still hazy on such details. Shi'ites in Nubol and Zahra Area? These could be rebel fighters, civilian-dress pro-government militia, or total civilians from either side. They tend to be fighting-age males, but that doesn't mean they were fighters or died fighting. Prime Minister Recep Tayyip Erdoğan has addressed Syrian President Bashar al-Assad from Ankara after a massacre of civilians by Syrian regime forces in Banias, saying “you will definitely pay the price for this.” “You will pay the price very heavily for your show of strength on little babies, which you did not show to others. The moans of these children that reach the skies will bring divine revenge onto you,” Erdoğan said in the closing speech of a Justice and Development Party's (AK Party) consultation meeting on Sunday. “We also have the responsibility of…Damascus, Hama, Aleppo and Homs on our shoulders and not just of Iğdır, Hakkari, Van, Sinop, Diyarbakır or İstanbul,” Erdoğan noted, addressing AKP members. “We have a responsibility to those victims who were brutally killed in Syria, most of them children and women,” Erdoğan said. A video issued on Wednesday from the northern province of Raqqa, which is controlled by Islamist rebels, showed three blindfolded men sitting on the curb of a central roundabout before being shot in the head with a pistol. A man speaking in the video said the executions were revenge for killings in the coastal town of Banias two weeks ago. ("the army") entered at 3:30 and they started shelling, it was around 20 to 30 shell in a minute. The houses were ruined and then they entered and killed everyone alive. This was only one street that I am telling you about if I include other streets, the number of dead exceeds 1500. They are over 1000 only in Ras-elnabe’. They brought a truck (freezer) and they started putting the bodies inside. They took more than 200 martyrs, more than 200 martyrs. ("the army") reached the first house and they forced all people out and they turned their faces to the wall and shot them all. Then in the second house, they killed around 4 or 5. At this time I put some of my family outside and I came back to take the rest of them to take them. Here when I came back I was forced to hide in a little basement. I was stuck inside so I said I am not better than the rest. They took all my family outside with other families. They turned their faces to the wall. They were around 35 members of my family. This is only from my family; there were other families as well. They asked them to turn their faces to the wall and they all did including children. The youngest among them was 15 days old. 8 children among them are aged between 15 days and one year and a half, two years, and three years. Then, one of the army men said literally ” kill all of them do not have mercy at anyone, kill all of them have no mercy at anyone”. I was at this moment in the basement and I heard everything ... After they killed the children. They piled them over each other. And one of them said look this one is still alive, and then they shot the baby in the head. They were picking them one by one and shooting them. If you have seen the pictures, there were two children after they killed them, they burned their hands and legs. Presenter: People also said that the killers were speaking a non Syrian accent. Through what you have seen, have you noticed this? Abu Mohammad: Yes yes my dear sister, there was speech I did not understand. I am Syrian from Banyas from Ras-elnabe’. There was speech I could not understand. Some of them were wearing (fatigues), others wearing civilians and white (shoes). They were around 150. ... And the killers belong to more than one sect. There are Alwitte and Shia and from Iran. There are accents I have never heard of. I am Arab and Syrian. I have never heard of such accents. There were the Rajab family, they killed 16 of them and also the family of Sabag, the family of Al-Aleene, the family of Turuk, the family of Dahbaj, the family of Jalul. The family of Jalul, they killed Abu-Alabed, his two sons, 6 girls, his parents, his two brothers. And the father of Abu-Alabed was disabled, he used the chair he cannot move. And you have also the family of Lahoof and Qasem. ... And there is also the family of Dandesh, they were all burned inside their homes. Three houses are close to each other, they burned them inside their homes. ... When I went outside I saw a little girl crawling and raising her hands. She was shot twice in her hands. When I saw her I felt dizzy and lost consciousness. A neighbour came when he saw me like this he waked me up and we took the little girl. There was also one man of her family still alive. Abu Mohammad: For an hour and a half they remained standing in front of my relatives’ house. After they turned their faces to the wall and shot them all, they went to continue killing in the other houses. They raided other families and the one after and after. ... I am telling you of what I have seen in my own eyes. I went to check what happened to the neighbours, I could not find anyone. More than 1000 died in this area. This is shaping up to be a massive propaganda effort with a time release factor set to revive it at the Houla anniversary and, well, now, as the world tires of the stalemate and considers what next. The BBC article is just one of many now appearing with new witnesses and details, like the Biyasi family, the loyalist Imam's, which lost over 36 members in this total Shabiha genocide! They even killed their own for no good reason. Also, all these and the WIkipedia page are just lumping these events together. I don't feel up to it ATM, but maybe there should be a page for the general disucssion of both, general patterns, etc. We have all this moving around and sloppiness requiring it (see below), so ... If so, all these articles should be linked and analyzed there. Yalla Souriya compiling some links here in case there are more. 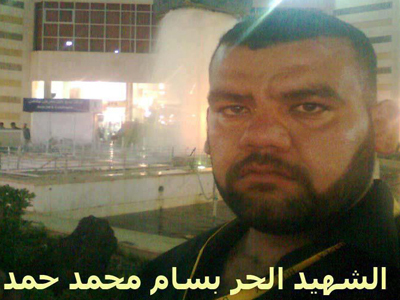 "Commander of the #Banyaas Massacre, who goes by the name 'Ali Kayali' and is from Antakya. These are the criminals who will only continue to kill. #Syria"
For now, I think we should keep these together. Maybe we can move this page to Baniyas massacre. Shows bodies in workshop. Later photo shows same workshop with bodies burnt. Warning: These bodies have beeed dead for three days. Bloated with maggots – Libya style. The SOHR photo (published earlier on May 8th by Syrian Revolution Digest, and here on May 5th and May 4th) of the pile is the earliest, taken at around noon. It is possible this photo is taken by the perpetrators of the massacre. Another photo (published earlier) shows the photo some two hours hours later. There is no movement in most of the bodies, confirming they are indeed dead and not acting out a massacre for the cameras. The girl in the red "28" shirt has been slightly moved. She is later seen lined up next to the pole. The woman in a black dress with a blue face has disappeared. The boy in a striped red shirt, originally lying on top of her, has been thrown further back in the pile. The body shows rigor mortis as his stretched arm is still in the same position. continued... The way the bodies are entangled is a mystery. Most likely they were dropped from a roof or balcony above the spot. In fact, my cache of photos has two photos filmed from above. 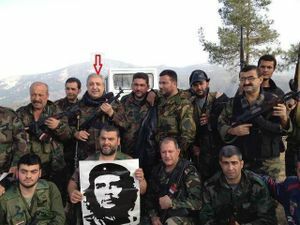 (One of them is here in the Syrian Revolution Digest post.) The photos from above, showing the 2 o'clock configuration, show the boy in the striped red shirt and the blue-faced woman on top of the pile, highly entangled with other bodies. It is as if the woman had been pulled from the pile in the noon picture. This would mean that the SOHR noon photo would have to be taken a day later. There are two videos (one in two different lengths) of dead families filmed at night with flashlights. One is the well known family in the pile, filmed outside. The other family is filmed inside in their home. The cause of death is mystery. Could be suffocation. His video also claims to be from the same place. Dead men wrapped in carpets. MAGGOT WARNING!!! 7 5 Baniyas Massacre Ugarit Banias, the fourth division of the army kills women c 1 +teeth Allahu Akbar! I believe the massacre happened on May 2, 2013. This rebel video (and this) shows the bodies outside, at dark, in heavy rain. Weather history for Banias, Syria shows it was raining at 11 pm on May 2nd. There was no rain or even clouds in the following days. There are two sets of photographs of the bodies. One set shows the bodies around noon, with Red Crescent workers moving and removing the bodies. Another set, taken some two hours later in the day, shows the undisturbed pile. It is my understanding that the body removal happened on May 4th. (I though I had a link to a photo published on that day.) Except for the movement of three bodies, the the two sets are largely consistent. I believe the nighttime video shows some of the bodies in positions that are inconsistent with either of the two daytime photo sets, necessitating that video is was shot on the night between the 2nd and the 3rd. I really wonder who posted this photo of the baby with burnt feet on the web on May 4th. The baby is lying inside on a carpet with burnt feet still in place. The baby was later thrown into the pile outside and never again photographed with the burnt stumps. The chemicals, which included monoethylene glycol and polyethylene glycol, were found in a storage site used by “armed terrorist groups,” Ja’afari explained. He said that Syria has started an investigation into the discovery. This page was last edited on 13 July 2015, at 00:29.